← September 16, 2018 – Waterside Restaurant – Brunch – Channel Islands Harbor – Oxnard CA. 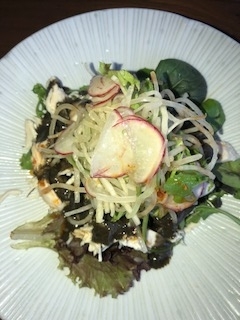 Dinner CHAYA Izakaya – September 23, 2018 – Venice, CA. This was one of the most memorable dinners in my history of doing Jodi Jackson’s Hollywood. The whole dinner was super special and tasty. The freshest ingredients, with the right amount of everything. I just can’t say enough about the delightful, inventive food at CHAYA. 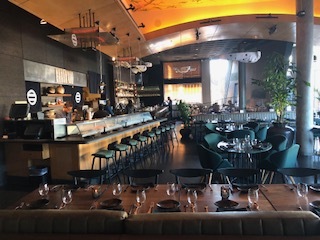 This past spring, the 28-year-old CHAYA Venice officially transitioned into CHAYA Modern Izakaya, inviting guests to discover innovative Japanese-Californian cuisine along with a brand new cocktail program. The room was filled with ambient world music; the vibe is very relaxed with a gorgeous interior. 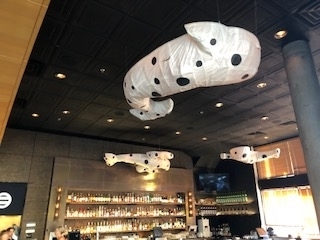 There are white kites that have been there since CHAYA opened. Nice touches of Asian inspired interiors make for a peaceful Zen type of atmosphere. Nathaniel Beaumond my server came from Minnesota a year ago, went to University of Minnesota, quite refreshing being that he is not an actor. He added just the right amount of knowledge and charm to my fantastic experience. CHAYA is reinventing themselves with smaller, shared plates and many more ala carte items on their menu. Kind of family style, where a table can order many plates that can all be shared. The whole restaurant seats around 130 guests, and they also have a very private party room. Watermelon Margarita, with Tequila, Agave, and Lime Watermelon. An extremely refreshing cocktail, with nice sour nuances, I just loved this one. Seasonal Caipiroska, Effen cucumber vodka, Leblon Cabaca, Orgeat, Lime. The cucumber is always a nice addition; it makes me feel like I am at the spa. It has a bit of a kick, but went down very well. 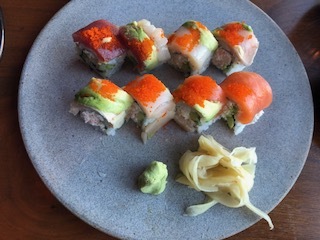 Rainbow Roll: scallop, albacore, tuna, yellowtail, salmon avocado, crab. This is the best freshest sushi roll I have ever tried, really remarkable. A great way to start my fantastic experience. 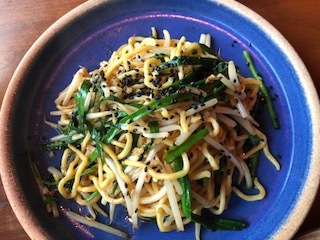 Garlic Chili noodles: chili garlic oil, sprouts, and chives. Another perfect dish, and a great accompaniment to my dinner. Sesame Chicken Salad: black sesame, Japanese cucumber, mizuna, and chili oil. The minute this salad goes in your mouth you taste the bold flavors of the black sesame. I couldn’t get enough of this salad. Seafood Paella: clams, mussels, gulf shrimp, calamari, lobster tail, saffron. All of the seafood is super fresh and delightful, with the perfect garlic flavors. Ribeye Steak: 14 Oz, three-peppercorn butter. The meat is super tender and the sauce is very simple, but a delicious steak, I would highly recommend this dish. Peach Parfait: mascarpone cream, brownie. 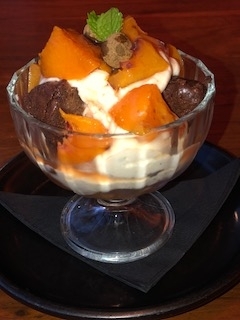 The peach parfait is light and creamy, with a touch of chocolate brownies, how could you go wrong? Milk Chocolate Croissant Bread Pudding: vanilla Ice cream, caramel. This is one of their standout popular items and I can see why, extremely rich and yummy. Sauvignon Blanc Preston, Dry Creek Valley, 2017. Dry Creek happens to be one of my favorite regions in Sonoma County; this wine has a bit of a fruity peachy flavor but just the right amount of acid to counter balance any fruit forward flavors. Chardonnay, Sebastian, North Coast, 2016. I just love a buttery Chardonnay and this one hit the spot. It paired so nicely with the seafood and garlic in the Paella. Zinfandel Blend, Killer Drop, North Coast, 2014. Another one of my favorite wines, this is a rich berry, jammy Zin, hitting all of the right notes, pairing with the Rib Eye Steak will blow your hair back. Groth Syrah, Napa Valley, 2017. This wine had some nice chocolate characteristics, adding the perfect balance with the Rib Eye Steak. At CHAYA Modern Izakaya, our innovative team of chefs have come together for the first time combining their skills and showcasing their Japanese-Californian cuisine in a modern izakaya setting, while utilizing local seasonal ingredients, the highest-quality seafood, poultry and meats. Corporate Executive Chef Yukou Kajino delivers not only a deft hand to creating this inspired cuisine, but also an intimate knowledge of the kitchen, the dining room and its guests, overseeing all aspects of menu development. Driven by the notion that cooking has no boundaries, Executive Chef Joji Inoue exemplifies a “Seafood Samurai,” showcasing his transcendental views through a respected culinary expertise. From introducing special omakase experiences at the Kaiseki Chef Counter, to pushing the boundaries on what one is capable of producing, Chef Joji elevates CHAYA Modern Izakaya’s commitment to innovation. Kaiseki Chef Katsuyuki Wako, whose tutelage and resume speak of his extensive Japanese education and extraordinary skill in the authentic culinary art ofKaiseki, brings balance and harmony to this powerful team with his meticulously prepared and exquisitely served multicourse meals that are as visually appealing as they are flavorful. With a perfectionist eye and Kaiseki palate, Chef Wako brings his seasonal and spontaneous mindset to Chef Joji’s European training, thus continuing the CHAYA cycle of bridging eastern philosophy with Western techniques. CHAYA Modern Izakaya also unveils a stunning new Cocktail Bar, where custom backlit shelving now fully displays the premium spirits and eclectic sake collection served at CHAYA Modern Izakaya. The sweeping bar counter also offers prime seating for guests to observe the craftsmanship of the bartenders executing each libation with the utmost integrity. 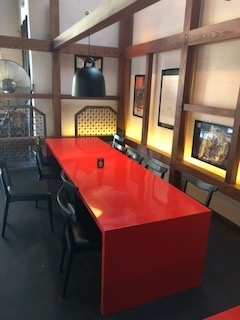 Every day from 5:00 pm until closing they have a great Happy Hour featuring Wines by the Glass, Draft Beer and Cold Sake Flights at special prices. Additionally, several Cocktails especially designed for Happy Hour are available, including Stone’s Lychee Martini, comprised of vodka, St. Germaine, lychee purée and lemon; the classic Highball made with Toki whisky and club soda, or the Last Mule, prepared with bourbon, ginger, cassis and lime. An extensive Happy Hour Small Bites Menu designed by Executive Chef Joji Inoue is also available, enticing guests with hearty dishes like Chicken Kara-age with mango chili and lemon pepper; the slurp-worthy Tequila Ramen featuring creamy chicken broth, braised pork and reposado tequila, or the perfect for summer Salmon Crudo, served with charred tomato ponzu, Fresno chili and yuzu. 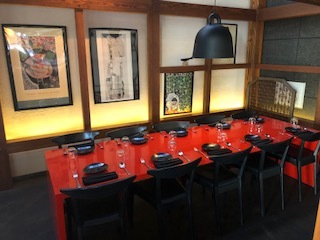 CHAYA Modern Izakaya serves Dinner every Sunday through Thursday from 5:30 pm to 10:00 pm, and every Friday and Saturday from 5:30 pm to 11:30 pm. CHAYA Modern Izakaya offers Happy Hour at the CHAYA Modern Izakaya Cocktail Bar every Sunday through Thursday from 5:00 pm to 10:00 pm, and every Friday and Saturday from 5:00 pm to 11:00 pm. I have tried all kind of dining experiences, but this one captured my heart and taste bids. Truly every dish was individual and beyond delicious. If you want an amazing experience where there is so much attention to detail, you too will be pleasantly surprised. 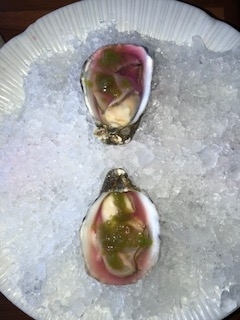 The next time you need a place to go in Venice, California, give CHAYA a try, you will be very happy and satisfied.